Businesses in Calderdale and Kirklees are being offered a full survey of their buildings to create a comprehensive Planned Preventative Maintenance plan. 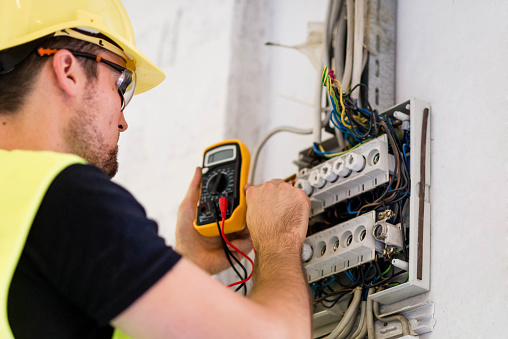 The PPM planning service is being offered by Huddersfield based Orchard Facilities Management and covers all areas of safety and compliance including PAT testing, fire safety compliance and fixed electrical testing. Managing Director Neil Ewing said: “The responsibility of keeping a business compliant can be complicated for business owners and this service is designed to relieve them of that worry. “One of the difficulties faced by employers is the fact that legislation is frequently changing. The PPM survey will take companies through their obligations as an employer step-by-step and analyse their operations to identify compliance risks and remedies. The service is aimed at helping businesses minimise risk and make sure they are fully compliant and have a plan to ensure they remain so. Neil said: “Business owners regularly tell us that they are concerned about compliance - they know they should be doing something but they’re not sure what measures to take and whether they have the budget needed to meet all the guidelines that apply to them. Orchard Facilities Management is to launch a staff working group to manage the business’s impact on the environment and maintain rigorous ISO14001 standards. The announcement comes as the company marks another successful ISO14001 audit confirming that its Environmental Management System continues to meet the high standards set by the International Organisation for Standardisation. Justin Holley, operations director at Orchard FM, said the working group would allow the company to uphold standards during a period of rapid growth and keep pace with an evolving marketplace. Justin said: “Setting up a dedicated team of staff will also enable us to reap even greater cost and environmental benefits from the system. “As we enter a period of high growth we are as committed as ever to delivering solid environmental credentials to keep our environmental impact to a minimum and deliver valued returns. “Cost savings naturally follow from environmental improvement initiatives and this is something we are keen to help our clients achieve as well,” added Justin. “We are delighted that our certification has been renewed and will continue to work hard to meet our obligations as a business. “The objectives of ISO 14001 fit well with our business and complement our activities and the issues we talk to our clients about every day in relation to waste management, compliance and efficiency,” he said. Gareth Henderson, managing director of Orchard Facilities Management, said the audit would also review health and safety compliance and best practice across the board. Orchard also operates a 24/7 facilities management helpdesk to handle enquiries across all disciplines to keep clients businesses running smoothly day and night. Mr Henderson said Orchard would be looking to implement a helpdesk function for HTAFC over the coming months.